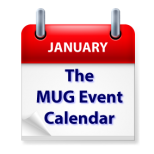 This week’s MUG Event Calendar is highlighted by a virtual visit to a Connecticut group by Allison Sheridan and an in-person presentation to a California group by Lynda Gousha. An Ohio group will look at both the Apple TV and Amazon Echo, and a Florida group will focus only on the Apple TV. Other topics for the week include Apple’s Preview, computer maintenance, the iPad Pro and a question over the necessity of Adobe.